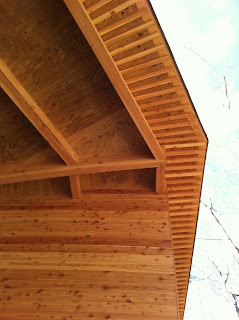 While on a site visit earlier in the week, I acquired a new word: taruki. Kenkyusha's defines taruki as rafters. But they are unlike rafters as we know them in the West. Slender roof underpinnings that resemble the underside of a mushroom, these parallel wooden bars support the roof eaves that wrap many traditional Japanese buildings. 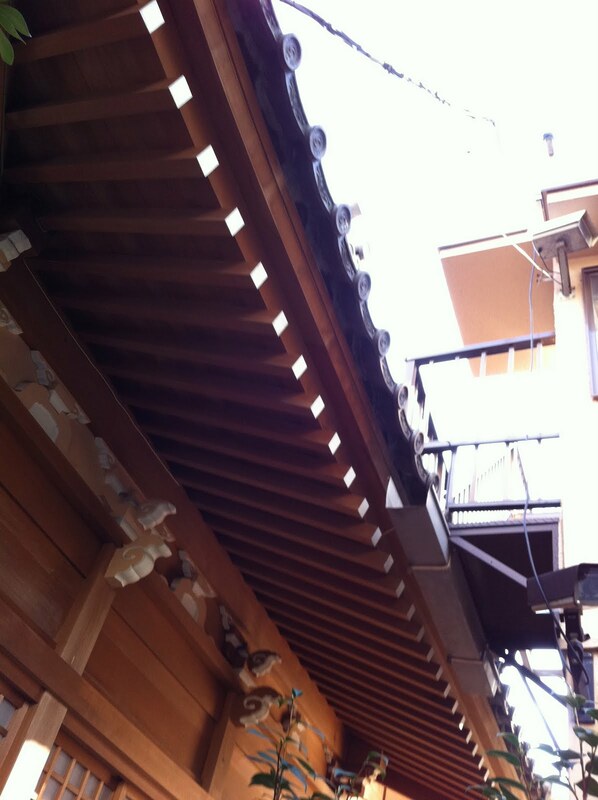 Taruki not only enable carpenters to cantilever the eaves but also to terminate the roof -- one of the most important elements in any traditional Japanese building -- with a little flourish. Think temple architecture. When rainy, the deep overhangs keep the water from pelting the building exterior. When sunny, they prevent strong rays from entering the interior. And, when deep enough, the eaves create those ambiguous, indoor-outdoor places loved by all in Japan.